What distinguishes the MKM Partners Trading Desk? MKM Partners is staffed by a team of professionals with an average experience of over 15 years per professional. The MKM Trading Desk understands market structure and acts as an aggregator of aggregators to ensure the best possible execution across all venues. 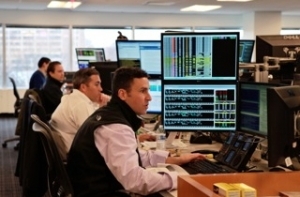 MKM Partners takes a client-centric approach to the trading desk. The traders know how each client of the firm prefers to trade and are aligned with meeting that client’s specific execution goals. MKM Partners is committed to becoming an extension of your trading desk by taking a client centric approach for the structure of the trading desk. The firms’ dedicated agency traders have, on average, over 15 years of trading experience and industry knowledge, and they utilize a high touch trading approach aimed directly to benefit our customers by understanding the method and urgency of how each individual customer trades. The firm has partnered with a variety of different vendors to access both domestic and international markets in order to ensure all available liquidity can be captured at any given time. MKM is fully transparent on how orders are executed and to which venue orders are routed. The MKM Partners team model ensures customers feel confident they have joined a partnership to share market information and obtain best execution. MKM Partners is dedicated to helping our clients meet their electronic trading objectives. Our electronic offering provides clients with access to a full suite of algorithmic strategies to help them successfully execute trades within a complex market structure while always maintaining anonymity. MKM does not internalize any client order flow nor does the firm operate a proprietary trading desk. MKM Partners is differentiated in the portfolio trading space by being able to combine quantitative trading techniques and automated electronic trading tools with the traditional sales and trading relationships. MKM Partners has forged together the traditional cross trading infrastructure with a highly quantitative platform, in order to minimize market impact and execution costs. MKM Partners utilizes the quantitative platform to disseminate the order flow through minimal impact zones, i.e., internal relationship crosses, controlled dark pools, crossing networks and primary exchanges. The objective of the trade is to minimize impact costs and outperform the trade strike benchmark target. MKM Partners provides a detailed pre-trade analysis report identifying potential impact costs on a portfolio and individual name basis. In addition, MKM Partners provides a detailed post trade analysis report highlighting the execution success versus the pre-trade estimates on a variety of benchmarks. The MKM Partners portfolio coverage team is fully knowledgeable with regard to all U.S. domestic index methodology, thus allowing for both reactive and anticipatory responses to potential index changes. In-depth experience within the coverage team includes quantitative portfolio construction concepts and capital market arbitrage activities (mergers, spinoffs). These attributes provide insights with respect to potential indices events, the potential impact to indices, share changes, and effective dates. MKM Partners is committed to the risk arbitrage and event driven space. The firm has a dedicated team of professionals encompassing research, sales, and trading. In addition to executing pairs, spreads, or ratio trades with algorithms the firm prides itself on the execution capabilities of our individual traders to execute orders discreetly and with obtaining the best price. MKM Partners has trading access to all U.S. Listed Options Exchanges. Whether trading customer orders electronically or using the trading desk’s vast liquidity relationships, MKM Partners has the capability to successfully execute any customer options strategy and serve as an advisor to portfolio hedging, increasing directional exposure, or offering insight into the current volatility environment with our dedicated option strategist . MKM Partners’ Options Trading Desk works on behalf of the customer to obtain the best prices and liquidity for every order.